In a world where it seems paper documents have fallen to the wayside, many people are surprised that the fax machine has endured this shift to a more digital environment. Not only has this office machine survived, but it is still widely used today in business communication around the world. When most people think about fax machines, their mind immediately flashes back to a noisy desktop machine that sends and receives paper documents and has a telephone attached. While some still have a phone, most of today’s machines are multifunction faxing systems, combining printing, copying, and scanning capabilities along with faxing. Faxing might still seem too time-consuming for some, which is why we prefer the fax server as a happy medium. Instead of printing every document that comes through, the server stores them electronically and sends them by email to appropriate recipients. Similarly, outgoing documents can be transmitted to the machine via email or as hard copies. While the original fax machine appears to pose interruptions, the modern fax server helps to improve workflow and efficiency throughout the day. It combines an affinity for paper documents with a need for quick, real-time communication, satisfying both types of users. At Pacific Office Automation, it’s our goal to say “Problem Solved” for every customer that walks through the door. Our teams work to figure out your needs and match them to our services or products, from IT management to multifunction printers. 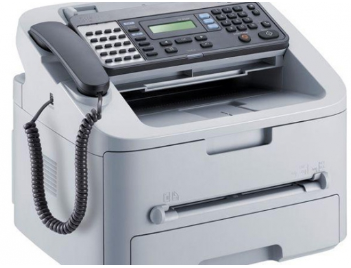 If you’re interested in buying or leasing a fax machine or other office equipment, contact us today. We’ll help you find the right equipment for your business.